Albert Kesselring, the son of school teacher, was born in Bayreuth, Germany, on 8th August, 1881. He joined the German Army in 1904 and became an officer cadet in the 2nd Bavarian Foot Artillery Regiment at Metz. During the First World War Kesselring was transferred to the German Army Air Service where he trained as a balloon observer. While in this post he developed a close friendship with Hermann Goering. Kesselring remained in the armed forces and was promoted to major general in 1932. The following year he joined the recently established Luftwaffe where he served under Erhard Miltch. 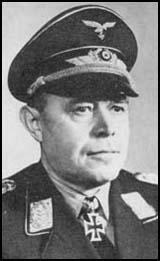 In June 1936, despite the objections of Miltch, Goering appointed Kesselring as the organization's chief of staff. On the outbreak of the Second World War Kesselring became commander of 1st Air Fleet and provided air support to General Fedor von Bock and Army Group North in the invasion of Poland. The following year he moved to the 2nd Air Fleet and supported the infantry in the invasions of Belgium, Holland and France. Despite criticisms for his performance during the Dunkirk evacuations, Kesselring was made a field marshal on 19th July 1940. During Operation Barbarossa Kesselring and his 2nd Air Fleet supported General Fedor von Bock and Army Group Centre in the invasion of the Soviet Union. He then moved to be commander of all German land and air forces in the Mediterranean. On 10th May he ordered the mass bombing of Malta. However, he was forced to abandon the campaign eleven days later when Adolf Hitler decided that the Luftwaffe had to concentrate its efforts in the Soviet Union. Kesselring remained in North Africa where he supported General Erwin Rommel in the Desert War. On 10th November 1942 Kesselring was appointed to serve under Benito Mussolini as deputy commander of Italian forces. In this position he was unable to prevent the loss of Tunisia and Sicily. In August 1943 Kesselring led the retreat from the southern regions of Italy. In September his troops came close to stopping General Mark Clark establishing a beachhead at Salerno. He also secured all airfields around Rome that resulted in the Allies calling off their planned airborne assault. Throughout the winter of 1943-4 Kesselring successfully contained the Anzio beachhead. In the winter of 1943 Kesselring withdrew his forces to what became known as the Gustav Line on the Italian peninsula south of Rome. Organized along the Garigliano and Rapido rivers it included Monte Cassino, a hilltop site of a sixth-century Benedictine monastery. Defended by 15 German divisions the line was fortified with gun pits, concrete bunkers, turreted machine-gun emplacements, barbed-wire and minefields. On 25th October 1944 Kesselring was seriously injured when his car collided with a gun coming out of a side road. He was in hospital for three months and his command in Italy was taken over by General Heinrich Vietinghoff. When he recovered Adolf Hitler named Kesselring as supreme commander in the south of the country. Kesselring, the only one of the early field marshals not to be sacked by Hitler, was taken prisoner on 6th May 1945. Tried as a war criminal he was found guilty on 6th May 1947 and condemned to death. Soon afterwards this sentence was commuted to life in prison and was released for health reasons in October 1952. The following year he published his autobiography, A Soldier to the Last Day (1953). Albert Kesselring died on 16th July 1960. (1) In his autobiography, Memoirs: 1940-1945 , Harold Alexander, wrote about the Anzio Campaign. Anzio played a vital role in the capture of Rome by giving me the means to employ a double-handed punch - from the beachhead and from Cassino - which caught the Germans in a pincer movement. Without this double-handed punch I do not believe we should ever have been able to break through the German defences at Cassino. Orders for the operation were issued on 2 January. The objective was defined as to cut the enemy communications and threaten the German rear. Fifth Army was ordered to make "as strong a thrust as possible towards Cassino and Frosinone shortly before the assault landing to draw in enemy reserves that might be employed against the landing forces and then to create a breach in his front through which every opportunity will be taken to link up rapidly with the seaborne operation". Despite the switch, in all, of five divisions from Eighth Army to the Fifth Army, German resistance on the main front remained stubborn; and during the early critical days the British and United States divisions at Anzio had to fight unaided for their own salvation. Meanwhile, on the Adriatic sector. General Montgomery had continued with his attempt to break through the enemy's defensive system; but with even less success as the weather worsened and the enemy's strength increased. Against a less formidable foe an operation such as we had devised would have succeeded; but I think we may well have underestimated the remarkable resilience and toughness of the Germans, in expecting them to be frightened by such a threat to their rear. Hitler's orders to Kesselring were to hold on to Cassino at all costs, for political reasons, and to eliminate the Anzio landing. The withdrawal of the Hermann Goring division from Italy was cancelled, and Hitler told Kesselring that he would be reinforced by two motorized divisions, three independent regiments, two heavy tank battalions and some heavy and medium artillery units. Thus the enemy refused to weaken his battlefront at Cassino by drawing back formations to deal with the landings. Every time we attacked Kesselring in Italy we took him completely by surprise; but he showed very great skill in extricating himself from the desperate situations into which his faulty intelligence had led him. I feel now that he would not, in these circumstances, have altered his dispositions on the main front to any great degree until he had tried every means to eliminate the threat to his rear. Nor need his determination be doubted. The forces under his command had been engaged in a continuous retreat for almost a year since November 1942, a retreat that had brought them just short of Alexandria to just north of Naples - and it was time to put a stop to it. About midday Kesselring telephones me and tells me that we shall probably have to wait three or four days before our large-scale counter-measures begin to get under way. Until then there can be no major shift of developments in our favour. Kesselring is nevertheless in good heart. He is assured and full of character in his estimate of the situation and there is not a trace of defeatism with him. He tells me also that the attitude of the civil population has somewhat improved under the influence of our propaganda. Müller is doing an excellent job. He has given Müller the widest powers so that he can operate with all the available propaganda resources in the western zone. Kesselring will now call me daily at midday to give me a brief situation report. I have the impression that he is fully in control of his staff and will not have dust thrown in his eyes. On Müller's suggestion he has had handbills distributed both to the troops and the civil population. On these handbills the civilians implore the soldiers to stand firm. These handbills are distributed to the soldiers by young people. In addition he has issued a call to the fighting troops explaining in a few sentences what is now at stake and why they must stand firm in all circumstances. I give Kesselring an expose on the present political situation which is extraordinarily interesting to him. All our leading soldiers are now convinced that recourse must be had to political means of putting a stop to the well-nigh desperate development of the military situation. But that is easier said than done, primarily because on our side we have no high-class diplomatic representative available. Ribbentrop cannot be seriously considered in this category.